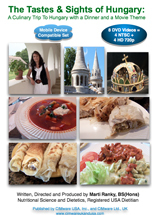 The videos include menus, explained and demonstrated in detail, and visits to sights: DVD-1 Tastes: Goulash soup, (Gulyás leves) and Assorted Strudel, (Rétes). Sights: Food in Hungary. Visit a small organic, as well as a large market in Budapest, and a summer food festival held over the Danube, on Chain Bridge (also in Budapest). Part 1 ends with a tour of the lively Christmas craft fair in Budapest. DVD-2 Tastes: Chicken paprikas, (Csirke paprikás), and Pancakes (Palacsinta). Sights: the historic town of Eger, traditional wine cellars, the famous castle, the site of major battles over 450 years ago. Tour the large and beautiful Basilica of Eger, as well as the historic town, and a demonstration of the over 1000 year old Hungarian runic writing. DVD-3 Tastes: Squash stew, (Tök fözelék) and Peach Dumplings (Barackos gombóc) Sights: the Open Air Village Museum of Szentendre (near Budapest) authentic, fully restored workshops and communal buildings, as well as special Hungarian breeds of farm animals. DVD-4 Tastes: Layered Potato and Egg Casserole (Rakott krumpli) with Cucumber salad (Uborka saláta) and Fruit Soup (Gyümölcs leves ). Sights: Budapest, the Hungarian capital, the Ancient city of Aquincum, Pannonia (near Budapest), and several, protected UNESCO World Heritage sites in Budapest, including the Castle Hill, the Hungarian coronation crown in the King Mathew Church (Mátyás Király Templom), Heros' Square, Opera, Basilica, the Houses of Parliament, the Museum of Ethnography, and others. We finish our program with a beautiful evening boat ride on the river Danube. DVDs 5 to 8 contain the same videos as above, in computer playable crisp 720p HD quality. System Requirements: DVD-ROM-1 to 4: NTSC USA standard definition (SD) DVD video player for TV, and/or computer. (All videos shot in full HD, rendered to SD and 720p HD). Approximate length: Part 1=65, Part 2=53, Part 3=62, Part 4=77 minutes, in 16:9 widescreen format, also playable on a 4:3 regular screen, or any good computer screen (800 x 600 resolution, or better). DVDs 5 to 8, are the same videos in 1280x720p (crisp HD quality MPEG4, .m4v) HD video format for Mac, or PC computers, or iPad, iPhone or other mobile devices. The DVDs run on a multimedia Mac, PC or Linux. Use a 800 MHz CPU or faster, and 16 bit, 800 x 600 dpi or higher screen resolution. The faster CPU and higher resolution screen the better. To play the 720p HD videos on Apple Mac, or PC, use QuickTime ver. 7 or later available FREE from: http://www.apple.com/quicktime/download. Apple and other mobile devices will play the high quality, crisp 720p HD videos. You can save them on your mobile device. Single user license! All rights reserved. Please visit http://www.cimwareukandusa.com for related titles & products. All trademarks acknowledged. 4 standard definition (USA NTSC SD DVD) videos and 4 crisp 720p HD videos ncluded in the boxset on 4 DVDs. Sample video clips in good 960 x 540p res. for web in MPEG4 (.m4v) Can be played on Mac, PC and even mobile devices (smartphones, tablets, etc. ): Clip-1, Clip-2, Clip-3, and Clip-4.